The people have spoken. Last week, in my weekly addition to the How-To section, I demonstrated How to: Cut an Avocado. The comments were positive (thank you), but there seemed to be a quiet chant, gradually increasing in volume, from the readers. “Mango…MANGO…MANGO“. As I said, the people were speaking, loud and clear. In an attempt to avoid a mob scene, I went to the store the next day to buy some mangoes. I used to have a heck of a time cutting mangoes. That darn flat pit baffled me and I often found myself staring at a pile of mangled mango slices, and I would then spend a frustratingly long time cutting the skin off of the fruit. That is, until I learned the hedgehog method. Mangoes have flat-ish, oblong pits. If you look at the left-hand picture below, try to picture how the pit would lie in the fruit. Turn the mango the other way (center). You will be slicing off the left and right sides of the mango. 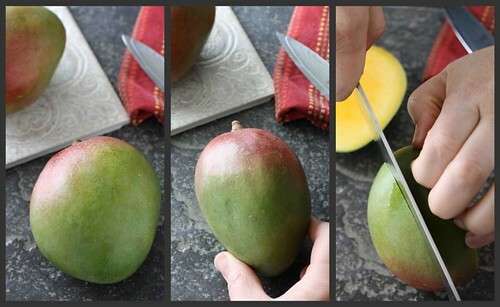 Sit the mango on its stem, hold firmly, and slice the left and right sides of the fruit away from the pit. These are known as the cheeks of the mango. Awww. Working with one cheek at a time, make vertical cuts across the fruit (left), taking care to cut to the skin, but not through it. Repeat the cuts in the other direction (right). This is the fun part. Place your thumbs on the outside of the fruit and push it inside out. It should look like a little hedgehog. Who knew the mango was such an adorable fruit? 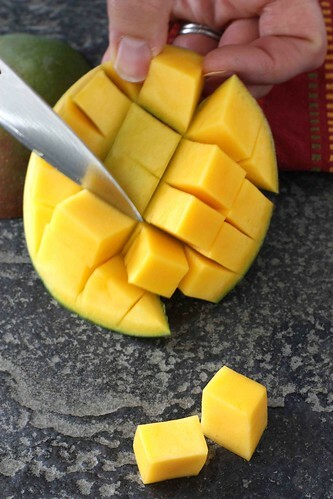 With a paring knife, carefully cut between the skin and the fruit to cut off the cubes. Each mango yields approximately one cup of mango pieces. 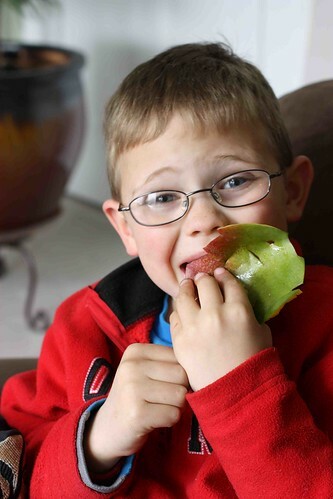 Of course, if you have a six-year old in the house that can’t get enough of fresh fruit and veggies, hand those mango peels over to him to make sure none of that juice is wasted. I’m glad this will be helpful for you. Wow, those mangoes look beautiful – just added some to my shopping list for the week (along with the ingredients for your turkey meatballs!). I know, the color of the mangoes is mesmerizing. I hope you enjoy the meatballs! Nice! I have a 9 lb box of mangos ripening, glad to see this right now. My kitchen prep has changed drastically ever since the onion tutorial. Love the “how to”, thank you! I’m so glad, Jeanine! Thanks so much for letting me know. They can be tricky little suckers. I hope this method makes things easier for you. Dara, So happy you did this tutorial. Often times when I have a mango ina recipe I wish ti include a tutorial to go with it. Is this your kid in the picture? He is absolutely adorable!! Thanks, Shulie. I’m glad you find this helpful. Yes, that is my youngest son. He’s a character – keeps us laughing. Terrific tutorial. My little guy absolutely loves mangoes- I’ll be trying this and he’ll be overjoyed to eat it just like your little man! I love it when I can find them perfectly ripe. Thanks, Lori. Yes, as you can see, there are some mango fans in this house. Great tutorial Dara. I’m not crazy about mango; maybe it’s the hassle to get the fruit. Makes you love the convenience of the apple doesn’t it? Yes, I do love the convenience of an apple, but you just can’t beat the flavor of a mango. Great photos! I was baffled by mangos when I first started using them a few years ago but once you realize how flat the pits are, they aren’t really so hard! Exactly, Kalyn! The pit used to throw me off and I was very happy when I finally figured out how to get around it. This was very helpful as I usually end up wasting half the fruit. Your son is absolutely adorable. Thanks, Maris. I’m so glad you found this helpful. I remember my mom doing it this way! She used to call it porcupine and we would pop the squares right into our mouths. I think that may be why I love mango so much. I’m looking forward to doing it for my kids this mango season. Thanks for reminding me! Perfect, Jamie! I’m sure your kids will love mango as much as you did as a kid. I always peel my mangos first. It makes for a slippery challenge but works well for me. Very good post. I picked up all the tropical fruits I could at the market yesterday. Nothing beats fresh mango, pineapple, kiwi mixed up in a bowl. Delicious. In Thailand and SE Asia, fresh mangoes are the closest thing to a dessert, although they’re not cut like this. They’re usually skinned with a paring knife, then cut around the stone into two lobes (give the stone to the young ones as a treat). Either way, try serving them with sweet coconut milk and sticky rice – soooo good. Also, if you have a real good fresh mango source, the skins are quite edible when ripe! 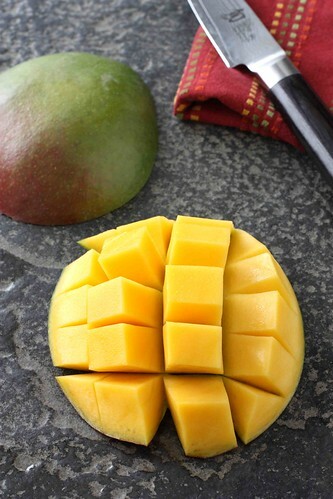 Have a couple mangoes right here…YUM! I too have a mango in the fruit bowl on the kitchen table awaiting its fate. The last one was a juicy frustrating mess, but I’m totally going to try this “hedgehog” method! I’ll have to try this way. I usually peel my mango with a vegetable peeler and then slice the cheeks off and cut. I just got a couple of mangoes yesterday, so I’ll have to try it. I love mangoes! Great tip! 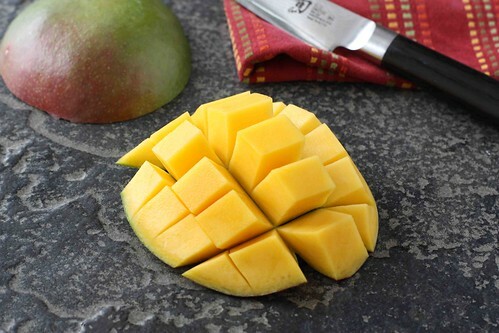 I Love the way mangos look sliced like that! Gorgeous photos Dara, have a great day! Oooo! I like to sprinkle them with cayenne and sugar! Thanks so much for this tutorial – especially as mango season draws ever closer! LOVE your step-by-steps Dara! So helpful! I love your steps and tutorials! I always love your tutorials, they are so helpful for so many people. I seriously love mango. If you like kale try Aarti’s Party Kale & Mango salad…so good!! Now this is a very helpful post. I love mangos, but I am a disaster cutting into these bad boys. I will try this technique and see if I end up with some pretty slices. Sounds easy enough. I think. OMG Dara – that last photo just kills me – LOVE IT!!! my favorite part is eating the mango! lol. 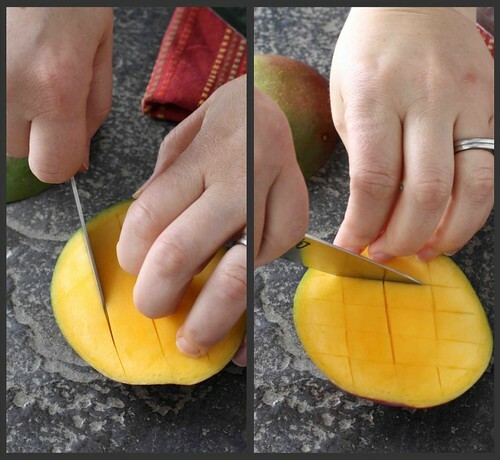 This is how I cut it too – love mangos! This post has changed my life!!! Thank you so much for sharing!!! I love a good ripe sweet mango. However, too many times when I buy them in the grocery store they are dark inside. Unfortunately I don’t live where they grow. If they are good and ripe they don’t need any sugar and have the best flavor!! GREAT step by step instructions. Thank you! I’m always having such a hard time cutting those buggers up. My 17 year old daughter cut one the other day using a different method and she did it perfectly. I have NO idea where she learned it – obviously wasn’t from me! Haha, maybe I should have looked at this BEFORE cutting the mango. I ended up with, just like you said, a pile of mangled mango pieces to feed to my 2-year old cousin. I don’t think he minded very much though! I actually use my potato peeler to remove the outer skin and then proceeded to cut the sides away from the pit. It worked pretty well. Bridget, a peeler definitely work, too. For myself, I find that is a little more difficult because the mango is so slippery once the peel is removed and I’m certain it’s going to slip as I’m trying to slice it. I need to follow your lead on this one, mine never come out right. Great tut.